It has been almost three years since the NFL witnessed Indianapolis Colts quarterback Peyton Manning raise the Lombardi Trophy. That night Peyton extinguished any remaining doubt that he was in fact among the greats in league history. On Sunday afternoon, he and the Colts punched their ticket back to the Super Bowl in typical Colt fashion. Down 17-6 with just minutes remaining in the first half, the Colt offense went to work. A drive consisting of four plays, eighty yards in 58-seconds capped off by a 16-yard Austin Collie touchdown. Into the half down 17-13 and back in business. . . . The opening drive lasted five minutes and twenty-five seconds. Ten plays, eighty yards, followed by a 19-yard Adrian Peterson touchdown. The Viking offense pounded the football, quieted the 'Bayou faithful, went out and took the lead. The next four quarters Minnesota would do more of the same, out rushing New Orleans by 97 yards, out passing them by 113 yards. On a day where Brett Favre went for over 300 yards in the air and Adrian Peterson rushes for well over 100 while hitting the endzone three times, but the Vikings lost?!?!? And with that, the New Orleans Saints are headed to Miami after a wild NFC Championship . . .
1) Peyton Manning is a butcher. Carving up the New York Jets with mind boggling ease. In a sure fire statement game, Peyton Manning flexed his Hall Of Fame credentials. 377 yards passing, three touchdowns, and 26 completions, Manning attacked the Jets defense with something they hadn't seen in months. With 19 passing first downs on the afternoon, the 12-year veteran went a long way to ensuring his team a trip back to the Super Bowl. As said countless times before this, his biggest accomplishment could be the players he's transformed into weapons around him. Sunday afternoon was like every other this season. Second year receiver Pierre Garcon set an AFC Championship game record with 11 receptions, and recorded 151 yards in the process. The virtually unknown a year ago Austin Collie grabbed seven balls from Manning and averaged 17.6 yards per catch. Peyton Manning has turned unknowns into household names and has ensured himself a spot in Canton. This being his 4th MVP season of his 12-year career, one could make the argument that Peyton Manning is the premier American sports icon and you'd hear little to say otherwise. 2) You can't cough the ball up and expect to win. While Minnesota played the game they wanted to play, tee time is at noon on Monday afternoon. The Vikings ran the ball, passed the ball, and unfortunately coughed the ball up just as often. Blame Brett for poor decision making on that final drive, but don't blame him for that loss. Tied 14-14 just before the half, Saints punt returner Reggie Bush muffed a punt inside his own ten-yard line. How did the Vikings capitalize? With a fumble off their own just plays later and went into the half missing a golden opportunity. That was the kind of afternoon it was for the Minnesota Vikings, and that's why they aren't headed to South Florida. Not a 300-yard passing game or 100+ yard rushing game can overcome five turnovers, it just doesn't happen at this level. Give New Orleans their due however, they managed to recover fumbles and intercept balls, they were the opportunistic team on Sunday evening. The pressure they put on Brett in the first half, the hard hits throughout the game, we shouldn't act like they didn't get into the Vikings head early and often. Of all the obvious statements thrown out of the mouths of NFL announcers, none is more poignant than "he who wins the turnover battle, usually wins the game." 3) Darren Sharper doesn't get talked about enough. World, your about to meet 'Nawlins Saints safety, Darren Sharper. The Saints safety slammed Favre to the turf time after time just after he got rid of the ball, he was the hawk defensive coordinator Gregg Williams cued up yesterday afternoon. 71 tackles and nine interceptions this season, Sharper remained quietly the leagues most game changing defensive back. In the postseason, he blew up. Yesterday afternoon he blitzed Brett Favre relentlessly, he made eleven tackles, and ultimately changed the game. The Saints defense may be the most underrated thing headed into the Super Bowl and Darren Sharper is a big reason why they'll surprise some people. When Sharper was one of the more highly sought after free agents this offseason, it was New Orleans who reigned him in. The active NFL leader in interceptions, Darren Sharper is creating quite a legacy for himself. The 9x Pro Bowler will head to Miami with Super Bowl thoughts and you can bet if anyone can find a chink in Peyton's armour, it's Darren Sharper. 4) Tip of the cap to Jets rookie signal caller, Mark Sanchez. I give Mark Sanchez a ton of credit. Sanchez embraces playing in the biggest media market in the country, he's under the largest microscope, and seems to let it slide right off of him. Throughout his three postseason appearances in 2009, Sanchez threw just two interceptions in nearly 70 attempts. Now before you tell me to hold up, the kid is just a rookie who can't lead an offense just yet but the pieces are in place. Sanchez is just as successful in his first season as Matt Ryan and Joe Flacco, he kept his team in it just as long as either of them. Furthermore, here's a kid who wasn't asked to do much after his hiccup in mid-season. On the other hand, he's 23 and mentally seems to be able to put it together. Let's face it, this league has very few quarterbacks who can handle the big stage, and Mark Sanchez is officially one of them. New York Jets offensive coordinator Brian Schottenheimer put Sanchez in the right spot to win, and he did. Till they got roughed up by Peyton Manning, Sanchez was putting up the kind of numbers you should ask for from a rookie quarterback. Pete Carroll was wrong, he is ready for the NFL. 5) 'The Gunslinger' I've got to comment on Brett Favre, if that was the last game he's ever played, I'd be remissed if I didn't. For all the "hating" I do on Favre, the guy is pretty amazing. At 40 years old he's still taking mind numbing hits, dropping tear drop 40-yard passes, and leading a division champion to he conference championship with a chance to win in the final minutes. My dad is about to turn 50 this Spring, 10-years ago he wouldn't get off a pass without getting dropped, granted he's a baker but you get my point. In his 19th season Favre proved he was this league. Throwing for over 4,000 yards and 30 touchdowns, Brett Favre was amazing. The 'Gunslinger' took a run oriented offense and converted them making the entire team around him better. 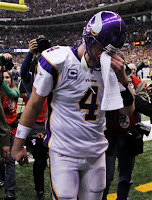 In possibly the last three games of Favre's career, he made a huge impact on at the very last one person. Wide receiver, Sidey Rice. The 3rd year receiver from South Carolina recorded 6 touchdowns in the last three Viking games. There is no doubt hype and sometimes undeserved hype has followed Favres career, but it shouldn't take away from the fact he is doing what no 40-year old on this planet could. Big ups to Brett Favre.